Monitor mode for Broadcom WiFi Chipsets: Working monitor mode on Nexus one & Galaxy S II !!! Working monitor mode on Nexus one & Galaxy S II !!! On the first day we bought our first android-based phone, we thought to ourself, "How nice it would be if we would be able to use the common 802.11 pwnage tools?" We quickly relized that the thing that is missing is monitor-mode support for the Wi-Fi Modules. This year, in our summer Vacation, we decided that we are going to add it ourselves. You might ask yourself why monitor mode is so very common among Laptop's & USB Wifi modules, and why there is not even one implementation of monitor mode for android devices. The short answer is that most of the common smartphones use the same chipset made by broadcom, named bcm4329 or bcm4330, and broadcom never added the support for monitor mode. The reason that those chips are so common in smartphones is that they combine every short-distance communication needed for those devices, and more importantly - they offload most of the protocol overhead to a dedicated processor, and communicates with the linux device with simple ethernet packets. During the last 3 weeks, we decided to take the mission of understanding how this device works. At first, we compiled the driver in debug mode, and noticed that the module strips the 802.11 headers in hw and sends only ethernet packets to the linux device. We concluded that in order to receive full 802.11 frames, a change to the device firmware is needed. So we started reverse engineering the firmware and after a few weeks we had a decent understanding of the packet receiving process. We havent tested it yet, but if you have a phone with one of those chipsets (and you most probably have one), it should also work on your phone. Create an APK bundle for "mass distribution"
I get "Can't find wireless tools, exiting." Nice work. Can't wait to see packet injection. any way to use this on the 4325? It shouldn't be too hard, but a change to the firmware is necasery and we dont have any bcm4325 device to do it with (the modification from 4329 to 4330 took only several hours). I've got an iPhone 3GS with a bcm4325, perhaps that's what he refers to? Wow, great work here!! I had also noted they were stripping the 802.11 header. I really appreciate this work, thanks so much. As I recall 4325 is brcmsmac and supports monitor already in the wireless-testing tree. Just a matter of using the backport. anyway.... OMG... funny how the official kernel dev's had said they were working on this for over a year and never got anywhere. Nice work, thanks for the great effort and having monitor mode is good. On a related topic, is it possible to get ad-hoc mode working on the bcm4330 chipset? I can do this on the bcm4329 (via CM7 on both Nexus 1 and Nexus S) with the iwconfig command, but I'd love to get this working on the Galaxy S II with CM9. btw- does this break "Managed" mode? Or can you easily switch back and forth between managed and monitor? Ideally, you should be able to create a second interface like "moni0" that is in monitor mode and doesn't touch wlan0, which still runs in managed mode. Is this possible? Currently it breaks the managed mode, so whenever the patched firmware is loaded - the chip is always in monitor mode. as of mon0 and wlan0, it is not simple at all, as broadcom designed this chip as a full mac, and our patch just converts it to a "stupid soft mac" and sends the packets out of the chip without any further processing. we can add this feature, but it will have a negative affect on the performance (meaning more packet loss and lower rate). Great, thanks for the response! I'm not sure how it would create packet loss though. As long as the monitoring interface is still just sitting on the same channel, it just gets all of the packets. The managed interface would just get the packets that are filtered to the client's MAC. The Managed interface expects to get Ethernet packets, and the Monitor interface expects to get wifi packets, so it's not just a matter of filtering. if we want to deliver both of them out of the chip - we would have to duplicate some of the packets on the chip, and this would affect the performance. another solution, when injection would work, we could implement a new soft mac driver on top of the monitor&injection firmware, and by this simulate the situation you described. True, although it seems like another solution to this would be to modify the driver to actually expect 802.11 packets. This might be the simplest solution and would not require duplication. I don't think this would require a new soft mac in the driver, would it? Anyway, very cool work and sincerely appreciated. Well, you are correct, but making it work in monitor mode currently has some other effects that makes it harder, like the fact that currently we completely disable the chip's association state machine due to the fact that we "steal" every incoming packet, including the association & beacon packets, so if we still want it to work, we will have to either duplicate these packets on-chip, or deeply investigate how some of these mechanisms work. As i said, its completely possible, but currently we prefer to concentrate on new and cool features like injection. Anyway, thanks for the great ideas and for the good words, We highly appreciate it. There is a CM9 port for it, will try to install it. Could this work on htc desire aswell ? as fair as i can recall these two are essentially the same hardware wise..
Should work - Please update us when you try! Are you sure that GS3 has bcm4334 and not bcm4330? Could you post a link to a tear down with this information or send us your firmware? A quick Google search reveals that it is indeed bcm4334. The only thing in /system/vendor/firmware is the .so file for the NFC chip. My S3 is running Paranoid Android which is a modified CM10. or just downloading the lastest CM10 nigtly sould work? It won't work, we need a phone with this chipset to create a patched firmware version. Would giving you those files help? Note, I'm not that other guy I just also happen to have an S3. Correct me if I'm wrong, but although the i9300 apparently uses bcm4334, I believe other models of the galaxy S3 (such as the US T-Mobile variant [d2tmo]) in fact DO use the 4330... if that is the case, then in theory one would just have to compile the code? I've been working on setting up a working cm9/cm10 build environment for d2tmo, but I've a lot to learn still...perhaps someone else could compile it for us? hi.. where can i get Programming guide and Data sheet of BCM4330..?? che .com.ar, hablan en español? gracias y saludos! Pretty damn excited to try this! Could this theoretically work on the iPhone 4? It has the BCM4329 chipset. I don't own apple hardware but it should be possible, we will try to team up with someone that own one. I got the following error when running setup on the epic 4g touch (Sprints galaxy s2). It has the bcm 4330 chipset. Any ideas of what's wrong? Also, can I inject into a Wi-Fi network? Look at your dmesg log, I guess you'll see wrong kernel ver magic. If this happens you'll have to compile the kernel module to your version or take a risk and replace the kernel ver magic. I am not familar with this. Could you please let me know how to compile the kernel module to my version or how to replace the kernel? Thanks a lot. According to ifixit the last Google phone, Galaxy Nexus, uses the BCM4330 chipset too. can't insmod on my device; no issue, compiling right now and will send you a new module for the att galaxy note once I have ensured that it works. Where should I send it? Work in galaxy note (N7000) ? Can you remove the client limit from the AP mode? You've reversed engeneered the driver so it shouldn't be so hard to do. I know somebody will say that nobody need it, but believe me, that some people need eg. 20 devices connected at the same time, and PC or USB WiFi module does NOT have such a limitation, so why do we have to have it on our android smartphones?? Wow you guys! I've been waiting for something like this for a long time and I would like to contribute by testing it on my GNote. If you guys have made one for the GNote send me an email and I will test it for you. You should run the script in the same directory of 'bcm4329.ko'. Make sure that you have the latest stable version of CM 7.2.0, had the same situation. Are there any other options that you could suggest? Thanks again, respect for your work. If Paket Injection will work, the support of 802.11s would be really cool. Many people work on this and if most of the mobiles would support mesh, there are great new use cases. Will this work on Tmobile GS2 t989 ? you need to run 'su' before. can you help me to compile this driver on acer a500? it have bcm4329 and caynogenmod 10. Using a Samsung Galaxy S3 here. The mantra wifi drivers are not compatible with either of these. Is there anything I can provide you with to help you reverse patch this driver? Tried the CM9 GS2 bundle on my Galaxy Note and I got this error. If you get "(Exec format error)" then probably you have a wrong ver magic. that means that the your kernel configuration is different than the one we used to compile our version. look at your dmesg log to confirm. I am using a Galaxy Note (N7000) with CM9-RC1. I used the dhd.ko from /system/lib/modules/ and replaced the dhd.ko from the CM9 GS2 Bundle, somehow I got this output when I typed in "sh setup.sh"
ifconfig: SIOCSIFFLAGS: Operation not permitted. I think I'm getting somewhere here. I guess the error could be solved by running 'su' but what you are trying to do will not work because of kernel version differences. I should be able to get this working on my nexus 7 (also bcm4330), i'll let you know what goes down. I also have an itouch 4 (bcm4329) that i think i'll mess with and see what I can do. let us now where you got, nexus 7 support would be neat. Am I missing something in your repository or does this involve only 2 line changes in the source? Trying to get it to work on the 4334 by myself. I will try converting our solution to bcm4334 this weekend, I don't know how to answer that yet. I tried compiling the source against a kernel for the ATT galaxy note (sgh-i717). No dice. Getting some errors when I try to send any sort of command to the chipset (the module I have compiled loads just fine now). The erros seem mainly centered around the bus (internal to 4330? ), not being ready. Double checked that note uses the 4330 and not the 29 or a newer chip like the 34. Unless they are misleadingly lableling the firmware, then it is truely a 4330. Any thoughts on the matter? I am compiling against a known stable kernel for cm9. Is there another place to discuss minor dev work other than this comment section (Dont want to contribute to clutter if there is)? You can email us at contact.bcmon at gmail dot com. Nope, nothing like that... sending off a log via email to you. Can someone post if they are able to get this working with their galaxy nexus? Can't get it working on HTC Nexus One Cyanogen Mod 7.2.0 stable with Super User permissions. Can tcpdump show the per-packet signal strength with the new driver? Is someone kind enough to show me a link to compile a dhd.ko? I would really like to help develop this. I was able to run the setup.sh script and the aircrack static binaries, but iwconfig and tcpdump keeps saying "No such file or directory". Missing shared libs? I'm using an I9100 and I tried with CM 9.0, 9.1 and the 09/16 daily build. Which CM9 version should I use or if possible kindly also include a static build of iwconfig and tcpdump. Thanks for your work! I also have this problem. Did you manage to solve it? I have a HTC Nexus One...How do u run the setup.sh on terminal like terminal emulator? have you "cd" to the correct DIR? or "su" first? I mean, do i need to do other thing, such as edit script? or just compile it from the checkout in SVN? will these steps able to make it work on s3? or this need a technical source code modify to make it work? I believe that in the next few weeks we will have a working firmware for this version. bcm4330! I have Root (super user). I tried 2 files at a time, bcm4329 or bm4330. I would be very grateful for the help me! Are the changes just in the firmware or do I have to compile the kernel module as well. I'm doing this on the nexus 7 ( 3.10 tegra, grouper branch ) which already has a version of the dhd driver built in..... I've broken that out as it's own module anyway but like I say do I have to use your dhd code? Any update on nexus 7? would love to help get this going. I would love to test a kernel...but I really like Using Ubuntu 13.04 on my N7. Im guessing it wont work after flashing another kernel. 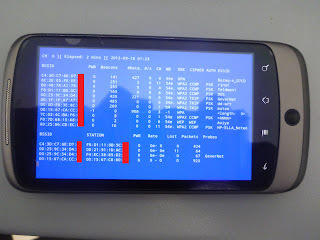 Im using the modified stock 4.2 kernel on this page: http://forum.xda-developers.com/showthread.php?t=2011403 Maybe someone with more skills could make further mods to this copy? Great work guys! I just wanted to ask a couple of small questions. I have a HTC 4G phone. I found a bcm4329.hcd file in supersonic's firmware directory in the CM android source tree. Have you done any modifications to this file? Also, is it possible enable the promiscuous mode on the bcm4329 card in the managed mode? The driver now is not stable. If we start tcpdump, it will stop capturing traffic after a few minutes or less. Looking at dmesg, we see ioctl errors. While using Galaxy S2 i9100 after running the sg setup.sh i get " original module loaded. disabling WiFi"
" Sh: can't open 'iwconfig', any ideas? 1. Can you comment on what the battery life is like under typical use-cases e.g. passively collecting packets? 2. How does the phone behave with respect to sleep mode? If you leave packet collection running, will collection continue until the phone battery is depleted or does the phone enter sleep mode after some interval e.g. 10 minutes? We didn't benchmark this, but it will drain your battery. after you finished capturing packets you should unload the monitor mode firmware. I got the Exec Format Error, but just then I saw the post asking for "Don't post any comments on this...". Will you guys ever work on the LG Optimus Black P970? I would buy you a pack of beers! Is there any way for samsung galaxy note n7000 to make the monitor mode worke ? I too have been working on monitor mode for Android, though using an external USB Wi-Fi card (ALFA AWUS036H) and without root. I've just released a proof of concept on Google Play and the source on github. More details at http://bryce-thomas.blogspot.com.au/2012/10/introducing-liber80211.html. Though your method requires root, I love that it uses the internal chipset. Any plans for putting together a basic tute on how you went about achieving what you did/something others can work off? I tried with Nexus S 3G, it works. But I also get some trouble. 1. I can only capture the traffic from clients to access point with tcpdump in 802.11n. But 802.11g works fine. 2. If leave the monitor mode for about twenty minute, the phone will reboot automatically. BTW, did you modify the firmware? Hello to all such, for samsung galaxis if 9000 has the BCM4329 chip, would also be compatible if carrying the cyanogen sigiendo galaxis steps 2, thanks for all friends. Do i need cyanogenmod, or is is possible to run it on lite'ning rom, too? Anyway is a great job and we know is a big effort. Go on developing this please! You can use hardly any kernel, bur you have to compile the dhd.ko fiel for your specific kernel to get it work. And you have to cross compole wireless-tools using the ndk to get aircrack working. How to build your driver for Galaxy TAB 2 (P3110)? You have to compile the dhd.ko file for your specific kernel. to update the airodump-ng oui file to get the latest vendor codes? as running the airodump-ng-oui-update script does not seem to work. This is all on a nexus one by the way. I got airodump working on a s2 with siyah-kernel! I simply cross-compiles wireless tools with the android ndk and it works! Latest vendor codes can be added by manually creating or copying airodump-ng-oui.txt from an updated installation of aircrack-ng and copying into /usr/local/etc/ on the phone, which didn't exist on my Nexus One so I had to create it first. Also I had to remount as rw to do this. Is it possible to switch back to managed mode without rebooting the phone? yes, ofcourse, yout just have to write a script, which unloads the dhd.ko-module and loads the orginal module (nearly the same thing, which does the setup.sh). Is it possible to enable a second wlan-interface with the bcm4330 chip? I tryed it, but I can't load 2 second interface with the orginal driver, because bove drivers have the same name. is it working for sg-gio? Do you need cyanogen to run this? I have compiled your driver for Galaxy Tab 2 but it does not start with your fw. What could be the problem? Hi, sorry for my English, I wanted to congratulate you for the excellent work, I wanted to know if you could release a driver compiled for the S2-SiyahKernel v5.0.1, I could not figure out how to compile it, you would be really nice. Or I potrste explain how to compile the driver for the S2-SiyahKernel v5.0.1. Hi, is there already a solution for the bcm4334? My phone is Samsung Galaxy Beam, kernel sources i got on samsung open source. Help! I am trying to load this onto an S2 skyrocket. I compiled the module and it appears to load, but nothing shows up in iwconfig. The dmesg appears to indicate that it has something to do with p2p. Anyone know how to fix this? <4>[ 217.328613] Firmware version = wl0: Jan 17 2012 09:18:41 version 5.90.100. _probe : the lock is released. Oh Here is the Coolest Stuff i am reading through this post. seems very interesting. team great work..is there an update on the s3 development. This doesn't seem to work on the Galaxy S2 Skyrocket. Getting the same error about "'dhd.ko' failed". What a shame, as we would love to provide assistance in developing. I would like to port 4330 driver to my phone (Galaxy Y GT-S5360). For that I need to compare the original kernel source and the modified version by you people. So if you post the original kernel source from which you started this work, it will be a great help for people like us. when are you gonna made it for Galaxy Y GT-S5360? it's a great thing because more people area using Galaxy Y GT-S5360. Would it be possible for someone to make a simple installer to make the process even easier? Or even a zip we could flash? I am using Galaxy Nexus with cm10. How can I use monitor mode on my device? Currently running gs2 rooted with jelly bean. Downloaded and followed your directions. Can't open monitor in terminal emulator??? Then I have installed Backtrack5arm from Google Play Store and aircrack-ng after that and then your instractions above, But I couldn't have a successful airodump-ng yet. Moreover, how should I recognize what's my phone's WiFi chipset? I wonder if it is bcm4330 or not! Please help me I'm working on this case for a week! # as you see the chipset is unknown! I HAVE SAMSUNG GALAXY CDMA POP SCHI559. hello,i have a Galaxy Nexus and its chipset is bcm4330, i had compiled dhd.ko ,but it cant works. <4>[ 9433.035888] Broadcom Dongle Host Driver: register interface [wlan0]dhdsdio_probe : the lock is released. can u help me to fix it ? I need help with my s3 l710. Help with Desire HD? It has the bcm4329 chipset.. I have Karbonn A21. so which tool i use ? Got this after "su" and "sh setup.sh"
man ! i want your help i am running cm 9.1 build#14 stable by yash which has bcm 4330 chipset and i am not able to run sh setup.sh on my htc explorer using terminal emulator pls help and give me simple instructions as you reply and remember that i am a noob in these internal cases . I just got hold of a spare Nexus One. Installed the bundle to get monitor mode working, and confirmed the setup.sh script runs with no errors. However when trying to execute airodump-ng I am getting a Permission Denied error. Any suggestions? Any way to get monitor mode working on CM 10.1 with 3.0.31-CM-ga034655 kernel & BCM 4330? it support se mini pro? does anyone have this working for the xoom? How do the s duos'm having difficulties? What i must to do if i want to work on my phone? I have a GS3 and i really don't know from where to start. I installed the apk and when i open it at firmware model it's says it's not detected. I must to modify the kernel ory something? My phone have the original kernel. All i do it to GS3 it's root. Can someone give me a help? Nice work, could I know how to trigger "monitor mode" in command lines? Thanks .